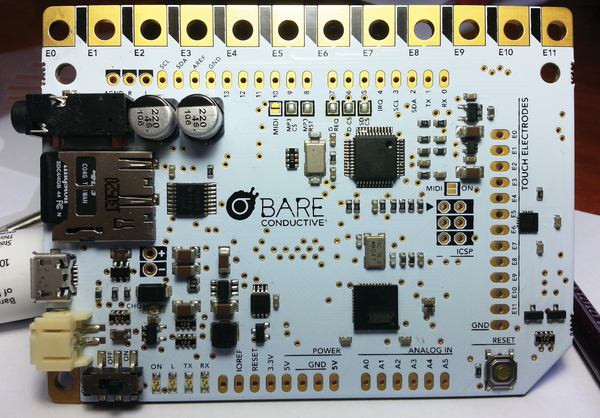 The Touch Board by Bare Conductive  is as interesting as educational Arduino-compatible boards get (Figure 1). First off, it's geared toward interactive and audio inventions. Although it's based on the Arduino Leonardo , with all the familiar I/O ports along its upper edge, it has a set of 12 touch sensors. Aimed squarely at educators, the Touch Board allows users to create touch-based and, as you will see, gesture-based gadgets using an electric paint also provided by the company. Figure 1: The Touch Board has a set of 12 touch sensors along its upper edge. Below that, you can find the standard Arduino digital I/O ports. On the right-hand side, and running top to bottom, are the same touch sensors again, with pinholes small enough to fit standard pins. Along the left edge, you have an audio out connector for headphones, a loudspeaker, a microSD card slot, a microUSB port, a socket to power the board by battery, and a GND electrode. Along the bottom, from left to right, is an On/Off switch, a set of four LEDs, some more standard Arduino I/O pins, and a Reset switch. One of the easiest things you can do immediately after unboxing the board is play sounds when one of the sensors is triggered, so I'll begin by showing you how to get started with the touch sensors. The board I got already had an SD card inserted, so all I had to do was plug it in through the USB port, hook up some headphones, and touch one of the sensors. The card supplied with the Touch Board contains a series of audio explanations about the board itself split over 12 tracks, each assigned to a sensor. Touching a sensor starts the playback of the corresponding track. To change them, all you have to do is copy your own tracks over them onto the board. and then "burn" SD.img to my card. (Note that I am working on Linux. To do the same thing on Windows, you have to a program called Win32 Disk Imager .) If you are not familiar with the dd command, check out the "Cloning Storage Devices" box). The dd command allows you, among other things, to copy the contents of a device into a file and then burn those images to other devices to make exact byte-by-byte replicas. For parameters, if stands for file in and can be a hardware storage device. My computer has two hard disks (/dev/sda and /dev/sdb), so subsequent externally connected storage devices (e.g., the SD card) show up as /dev/sdc onward. Therefore, if I connect a second external storage device, say a USB thumbdrive, it would show up as /dev/sdd. The next parameter, of means file out and points to the name of the file you want to copy the device to. Note that I said "the device." Not only are the contents (i.e., the files) copied, but so is the filesystem type (i.e., the structure) in the byte-by-byte copy. In fact, the resulting files will be exactly the same size as on the hardware device you are copying. The SD card supplied with my board was 2GB, so I ended up with a 2GB file. where /dev/sdc is the new SD card I popped into the reader. Be aware that this will annihilate all the existing content on the target device, and you will not get any warning that this is what's about to happen, either: If you're root on Linux and wielding dd, you're supposed to know what you're doing. If copying files doesn't work for you, try cloning with dd, and you should be able to use your own card instead of the card that comes with the Touch Board. The first project I want to tackle is making the Touch Board into an MP3 player. All you have to do is to choose 12 tracks, rename them track000.mp3 through track011.mp3, and copy them onto your microSD, erasing the original clips in the process. After pressing the Reset button on the board, you can then play the tracks by touching the sensors along the side of the board. So, you now have an MP3 player that can play 12 songs. Not very cool, you might think, but to change that, you can break out the electric paint. 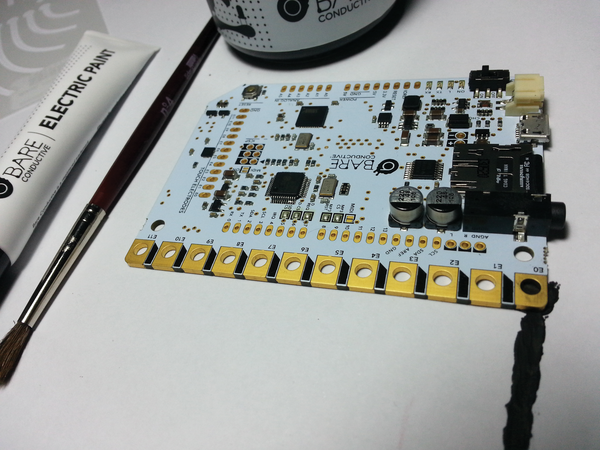 The paint supplied with the Touch Board is a conductive, water-based substance with minute, suspended metal particles. It has the consistency of oil paint (although it can be diluted to make it thinner ), and it takes between 20 and 30 minutes to dry. The paint is even non-toxic, so it's safe for kids to use. You can use it to paint circuits or to extend the sensors; by using blobs of paint, you can do "cold soldering" and integrate elements, like resistors or LEDs, into your circuit; as explained below, it can also be used to create a gesture-sensitive surface, similar to the Hover board I wrote about in the last issue . However, I don't want to get too far ahead, so the first thing you should try is just to paint a line (or, in my case, a smear) and put a blob of paint on the end. Stick the Touch Board to the blob, as shown in Figure 2, power it up, and connect your loudspeaker. Now put your finger on the smear. You should hear track000.mp3 play. Figure 2: The streak of electric paint is connected to sensor E0 with a thick a blob of paint on the end that "solders" it to the painted circuit. Although it's only a smudge on a piece of paper, consider the possibilities. You could paint animals and play back their recorded sounds; draw letters and words, and play the pronunciations; and paint a piano keyboard and associate each sensor with a note. Even better, get your kids to do all of these things! However exciting these ideas are, you can do even more. But for that you'll have to get into programming.